Pasta is a great family meal, especially on those days when you have very little energy after a long days work, but still want to give your family something home made and nutritious. There is no need to resort to a ready meal when you have good quality pasta and some fresh ingredients in the kitchen cupboard. So many people say that they cannot make pasta at home taste as nice as pasta from a restaurant. The problem is too many people buy cheap pasta and over cook it, then smother it in store bought sauces and grated cheddar cheese! The first rule of making delicious pasta is to buy good quality pasta in the first place. Although you can save money by buying supermarket value brands, pasta is such a relatively cheap meal, even if you buy the best possible pasta, that it really makes all the difference. There is no need to buy fresh pasta, unless you really want to. Italians buy good quality dried pasta – try an Italian make next time and taste the difference – it’s less than a pound more and is so much better. So, you’ve bought good quality, dried Italian pasta. To cook it well, the secret is to use plenty of boiling, salted water in the biggest saucepan you own. Ideally, use a big stock pot with a lid. Have the lid on the pan to get the water up to a rolling boil quicker, throw in a handful of salt (yes it seems like a lot, but it’s the Italian way and really adds flavour right into the pasta, rather than relying on loads of sauce). Next, add in your pasta, about 80 to 120 grams per person for a main course, depending on appetite and how filling the sauce is (you’ll want a bit less pasta if you have a sauce filled with meat and/or vegetables, rather than just a coating sauce). It is important to keep the water at a rolling boil as you cook the pasta, but do not put the lid back on, this makes the pasta too sticky and glutinous, rather than al dente. Cook the pasta according to the instructions on the pack – usually around 8 to 11 minutes. 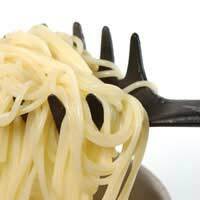 About two minutes before the end of cooking time, take a piece of pasta carefully out of the pan and test it. It needs to have some resistance, but not be too hard or taste floury. About 30 seconds to one minute before you think it will be perfect, drain the pasta over a colander, reserving a mug full of the cooking water before you drain. Tip the cooked pasta back into the now empty pan and add in your chosen pasta sauce. Here are a few recipes for you and your family to enjoy cooking and eating together. This spicy tomato sauce is light, healthy and delicious. Gently fry an onion and a couple of cloves of garlic in some olive oil, add a tin of Italian chopped tomatoes and half a teaspoon of chilli flakes. Season, cook it down to thicken and add to your pasta in the pot to cook together for the last minute. Serve with plenty of grated parmesan and torn basil leaves. This unusual pasta dish is a really tasty recipe, using simple ingredients. Grate three or four courgettes. Fry a couple of cloves of chopped garlic, with four anchovy fillets and a large pinch of chilli, in plenty of olive oil. When fragrant and the anchovy has ‘melted’ add in the grated courgette and fry all together while your pasta is cooking. Drain the pasta as above and add in the courgette mix, adding some of the reserved pasta water if it looks too dry. Cook together for the last minute and serve with lots of fresh parmesan and cracked black pepper.